Avaliable in paperback from Amazon. 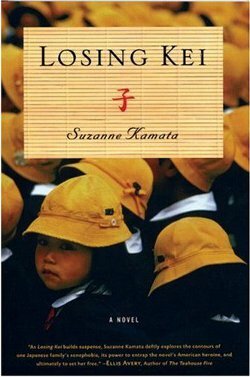 Susanne Kamata’s novel Losing Kei (Leapfrog Press, 2007) is a unique and entertaining break from all that. When we first meet Jill Parker she is stalking a young boy and hoping to catch a glimpse of his face. Just as she does, a woman she knows as his grandmother rushes out and pulls him away, pressing his head “firmly against her side.” Jill then admits that the boy is her son, Kei, and that she has lost him again. This short scene introduces us not only to the key players in the book, but also the conflict that drives it. Soon, as the book jumps around in time, we meet Jill as a young painter who, almost on a whim and as part of an emotional rebound, departs for Japan. Once in Japan she opts for isolation and chooses a small city in Shikoku because she’s heard it’s almost foreigner free. There she becomes a hostess at a bar, does a little painting and falls for Yusuke, an art gallery owner who treats her differently than other Japanese men, and even her own family, by telling her she has talent and encouraging her to keep painting. Eventually, Yusuke and Jill marry and have a child. At this point, Jill’s desire to be more Japanese clashes with her western instincts when she discovers, and learns to resist, the role of wife-as-servant in her husband’s house. This leads to battles with Okasan, Yusuke’s mother—and the grandmother from the opening—who demands the untraditional wife fulfill traditional Japanese duties. For this and other reasons, the couple divorce and Jill learns she has no rights to her own child. This leads to a pursuit that slowly and steadily grows in intensity and, your humble editor would argue, culminates in a simultaneously beautiful and preposterous scene that nonetheless somehow works. The novel’s ending, which will seem deus-ex-machina to some readers, is culturally perfect and a suitable end to the long struggle over Kei. Despite his enjoyment of the book, your humble editor did have a few issues with it: first, in his copy, pages 97-128 were repeated twice and, therefore, pages 65-96 were missing. If possible, readers should carefully check their editions before purchase. That said, the missing pages didn’t hurt his overall enjoyment of the book, but it did cut out at least three key plot points. Your humble editor also didn’t fully understand the nature of the fellowship that brought Jill to Japan and was surprised she could suddenly opt to change cities and do no fellowship-related work. Also, although the book portrays the cultural dilemma and the characters well, it seems to take place on a blank background. Except for a description of surfing and a terrific image of the detritus left on the beach after a typhoon, the author spends almost no time with description and setting. Tokushima could be any city anywhere. This is a surprise given that the narrator is a painter. That said, Losing Kei is driven by plot and by character. What Jill does is, in the end, more important than where she does it. Jill Parker’s goal was to go where no one spoke English, to immerse herself and hide in the culture. Ironically, she clashes with the culture and it causes her immeasurable pain. Kamata manages to portray all this without being blatantly critical. The culture just is and, ultimately, there is no moral to the story other than perseverance. Why Jill does what she does is never always stated openly but, in a quiet, very Japanese way, it is all consistent and all makes sense. For a Westerner, Suzanne Kamata has produced a surprisingly Japanese novel. Your humble editor recommends it for all expatriates coming to Japan. For those considering marrying into a Japanese family, it should be considered required reading. NB: Your humble editor also recommends that long term sufferers check out Playing for Papa by Kamata and Yuka Hamano. Although written in English and Spanish, it's a nice children's book about an atypical family in Japan.